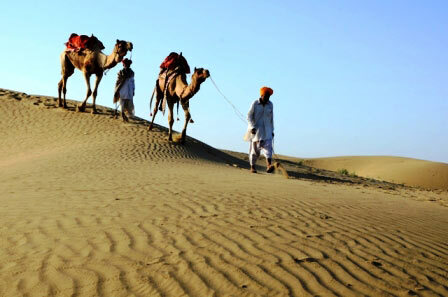 In this travel you can have idea of life in desert. See all the color of Rajasthan.Rest all exp. Arrival at Beautiful pink city Jaipur. Meet your driver and drive straight to hotel. Warm welcome at hotel. After lunch start for sight seen of Jaipur city palace, wind palace and Amer fort. Over night in hotel. After break fast start for holy town Pushkar. Arrival at hotel check inn and go for visiting of town where you see the temple of Brahma and lake. Rest day for leisure. After breakfast start for vanish of India Udaipur. One of the best romantic cities in India. Arrival at hotel check inn and evening for leisure. After breakfast start your visit in lake city Udaipur. City palace, friends garden and etc. Evening have visit of painting school. Over night in hotel. After check out start for kumbhalgarh fort (world second largest wall ) visit. Having lunch on the way, after visit the Jain temple of Ranakpur. Evening arrival in city blue Jodhpur. Check inn over night hotel. 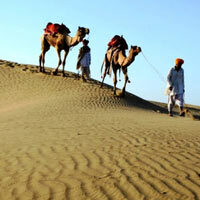 After breakfast and check out go for visiting meharangarh fort and jaswant thada and start for Golden city Jaisalmer. Arrival at hotel check inn and go for desert tour for camel ride. Overnight in hotel. Morning start for sight seen Jaisalmer fort ,lake and havelies. After lunch start for Desert town Bikaner. Check inn and overnight in hotel Bikaner. After check out visit the fort of Bikaner. Drive direct to the Jaipur. Check inn hotel and day for shopping and relaxing. After having breakfast time to go home with sweet memories of Rajasthan. All bookings and confirmations are subject to availability. Amendment charges, cancellation charges will be applicable as per our terms & conditions. Any increase in the hotel tariffs, fuel charges or taxes, which may come into effect prior to the departure, will lead to an increase in the tour price. Any difference in the price will be payable by the client. There will be no refund on unused service. The hotel names are given for guideline purpose. The confirmation could be in the same or an alternate hotel in a similar category, subject to availability. All booking terms & conditions of A.R.T.C.will apply.